to recap Michael's season thus far, he had a very hot start to 2018, but has since cooled off. if you read through my Brantley's June 2018 #s blog, then you know he struggled in just about every facet of the game. it was very disheartening to see Michael go from batting .366 (30-for-82) during his 19-game hitting streak in May, to batting .243 (25-for-103) over his next 26 games, including nine 0-fers, since then. however, because he excelled so much in both March/April and May, the majority of his overall numbers and situational statistics remain strong. another big positive is, he's been healthy. not only that, but the extra off days Terry Francona was giving Michael in the beginning of the campaign are no longer necessary. i think we can officially stop worrying about his ankle now (knock on wood👊). and here's hoping that the new calendar month will bring Michael back to the high level of performance that we're used to and he's capable of. 2018 regular season numbers and statistics from March 29 - June 30. Michael's .306 batting average is currently the highest on the team out of all the qualifying players. 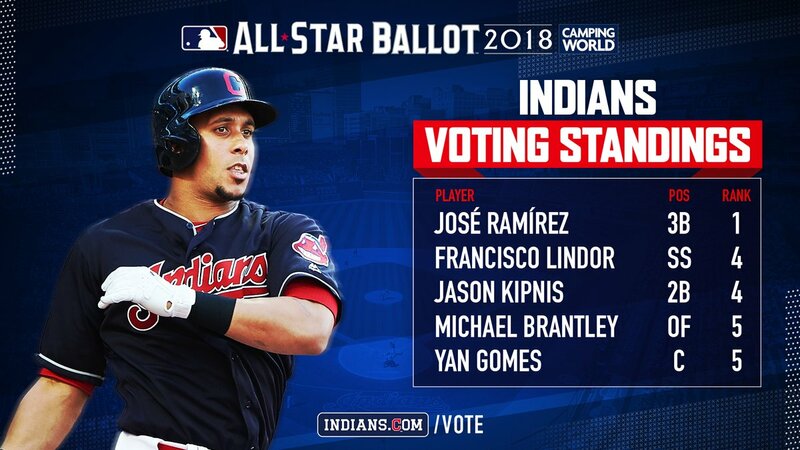 Jose Ramirez is the closest behind him, batting .291.
through June, Michael leads the team with 57 singles and a .306 batting average. he's tied for the team lead with 2 grand slams. also, among qualifying players, he has the least strikeouts with 29. Michael is 2nd on the team with 3 sac flies and tied for 2nd with 1 triple. in addition, he's 3rd with 87 hits, 30 extra base hits, 18 doubles, 41 runs, 140 total bases, .355 OBP, .493 SLG, and .848 OPS. he leads the outfielders with 100 putouts, 545.1 innings, and 63 games played. he's tied for 1st with 1 double play and 2nd with 3 assists as well. after consulting my records of Michael's stats throughout his career, i discovered that he only has one career high through June--his 2 grand slams. Michael has 11 home runs in 2018 through June, which for him is more than acceptable. he only hit two long balls in June though, after hitting seven in May, so the power definitely dipped a bit last month. but that's okay because no one expects Michael to have 30 bombs at the end of the year. he's on pace to maybe have 17 or 18 this year and i think that's excellent for him. 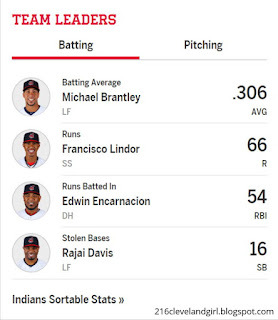 the team leader in home runs right now is still Jose Ramirez with 24. Francisco Lindor is 2nd with 20, Edwin Encarnacion has 19, and Yonder Alonso has 12. Michael's 11 rank 5th. no one else on the team has double digit homers at this time. three months into the campaign, Michael has 44 RBI versus 102 men left on base. i feel like he's still having his opportunities to drive runners in now that he's taken over the 2 spot in the lineup, but maybe there's not as much traffic as there would be if he was batting one or two spots lower, if that makes sense. since he struggled to hit as a whole in June, a few of his teammates have passed him in regards to the RBI leader race. 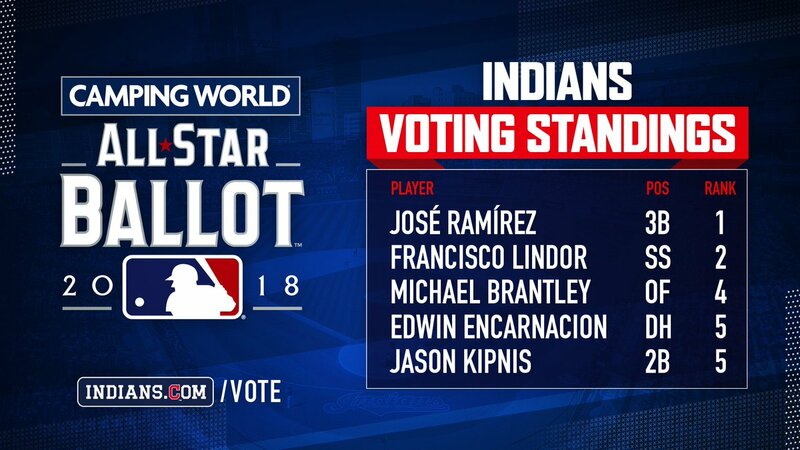 Encarnacion leads the Tribe with 54, followed by Ramirez's 53. Lindor has 46 and Michael's in 4th place with his 44 ribbies. Alonso rounds out the 40+ club with 43 RBI of his own. now let me calculate the new HR:RBI ratio. eight of Michael's 11 home runs were solo, one was a 2-run bomb, and two were grand slams. therefore, 18.2% of his 44 RBI have come from his solo homers, while 40.9% of his 44 RBI have come from all 11 of his home runs. Michael's K rate so far in 2018 is 9.4% (29 K/310 PA). he currently averages 1 strikeout for every 10.7 plate appearances. good to see Michael remains one of the hardest players in the majors to strike out. Michael has reached base a total of 116 times in 2018 via hits, walks, hit by pitches, fielder's choices, forceouts, fielding errors, and throwing errors. he's scored 41 runs total, 11 of which came from his own home runs. he's been driven in 30 times by other players and left stranded 66 times. (he was lifted for a pinch runner four times, caught stealing three times, caught in a rundown once, and thrown out at 3rd base once, so i had to subtract nine from the total count here.) that's still too high for my liking and i hope Michael's teammates can get him across home plate more in the second half of the year. Michael hit in 54 of the 70 games he's played in so far in 2018 and reached base safely in 63 games. he has 16 hitless games, but still reached base in 9 of those. Michael has 24 multi-hit games, 8 three+ hit games, and 10 multi-RBI games. he has at least 1 RBI in 29 games. in addition, he has 8 go-ahead hits and 9 go-ahead RBI. the Indians are now 40-30 in games that Michael's played in and 4-7 in the games he's missed/sat out. --an 18-game on-base streak on the road between July 1 - August 1, 2017, and April 16-22, 2018. it spanned over July 1-2, July 14-19, July 28-29, and July 31 - August 1, 2017, and April 16-17 and April 20-22, 2018. --a 14-game hitting streak on the road between July 15 - August 1, 2017, and April 16-22, 2018. it spanned over July 15-19, July 28-29, and July 31 - August 1, 2017, and April 16-17 and April 20-22, 2018. --5 consecutive multi-hit games between April 11-20. they spanned over April 11-12, April 17-18, and April 20. --a 9-game on-base streak between April 8-22. it began on April 8, then continued over April 10-12, April 17-18, and April 20-22. --a modest 7-game hitting streak between April 11-22 (over 12 days). it spanned over April 11-12, April 17-18, and April 20-22. --a 9-game on-base streak at home between April 8-29. it began on April 8, then continued over April 10-12 and April 25-29. --a 7-game hitting streak at home between April 11-29. it spanned over April 11-12 and April 25-29. --a 9-game hitting streak on the road between May 9-23. it began on May 9, then continued over May 14-16, May 18-20, and May 22-23. --a 19-game hitting streak, in which he bat .366, between May 9-30 (over 22 days). --a 21-game on-base streak between May 8-31. it spanned over May 8-9, May 11-16, May 18-20, and May 22-31. --an 11-game on-base streak on the road between May 8-31. it spanned over May 8-9, May 14-16, May 18-20, May 22-23, and May 31. --a 16-game hitting streak at home, in which he bat .394, between May 1 - June 6. it spanned over May 1-3 (including a doubleheader on May 3), May 11-13, May 24-30, and June 5-6. --a 15-game on-base streak between June 11-27. it spanned over June 11-13, June 15-20, and June 22-27. --a still active career high 25-game on-base streak at home between May 1 - June 24. it spans over May 1-3 (including a doubleheader on May 3), May 11-13, May 24-30, June 5-6, June 15-20, and June 22-24. Michael is currently batting .313 (65-for-208) against right-handed pitchers and .289 (22-for-76) against left-handed pitchers. both of these averages went down due to Michael's struggles in June. i'd definitely like his numbers against southpaws to get up towards .300 again if possible. i know he can do it. Michael's hitting .351 (52-for-148) with 33 RBI at home. he has 13 doubles, 1 triple, and 6 home runs (20 extra base hits) at Progressive Field, along with 2 sac flies, 26 runs, 8 walks, 2 hit by pitches, 5 stolen bases (2nd), 1 caught stealing (3rd), 4 GIDP, 12 strikeouts (7 swinging, 5 looking), and 85 total bases while playing 37 out of 40 total home games. he reached base on 3 fielder's choices, 1 forceout, 1 fielding error, and 1 throwing error as well. he hit safely in 31 of the 37 home games he's played in and safely reached base in 35 of them. he has 6 hitless games at home, reaching base in 4. he has at least 1 RBI in 19 home games. Michael's hitting .257 (35-for-136) with 11 RBI away from Progressive Field. he can't seem to hit on the road anymore, as his road average decreased even further for the second straight month. he's now almost 90 points lower than where he was the end of April. not only that, but there's such a disparity between his home and away splits, which seems to be the trend this season with the Tribe, but is totally abnormal for Michael. he has 5 doubles and 5 home runs (10 extra base hits) on the road, along with 1 sac fly, 15 runs, 13 walks, 2 caught stealing (2nd), 4 GIDP, 17 strikeouts (15 swinging, 2 looking), and 55 total bases while playing 33 out of 41 total road games. he hit safely in 23 of the 33 road games he's played in and safely reached base in 28 of them. he has 10 hitless games away from home, reaching base in 5. he has at least 1 RBI in 10 road games. Michael's now batting .278 (20-for-72) with runners in scoring position with 32 RBI through June. more specifically, he's batting .385 (5-for-13) with RISP and 0 outs, .320 (8-for-25) with RISP and 1 out, and .206 (7-for-34) with RISP and 2 outs. clearly the reason Michael's overall average with RISP decreased so much from a month ago is because he's having a lot of difficulty with 2 outs. and the fact that he's had the most at bats with 2 outs and RISP isn't helping things either. with 2 outs in an inning, Michael is presently batting .265 (22-for-83). a terrible showing here in June dragged his average down over 50 points! he now has 5 doubles, 1 triple, 3 home runs, 16 RBI, 6 walks, 1 hit by pitch, and 9 strikeouts (8 swinging, 1 looking). additionally, he's hitting .325 (39-for-120) with 36 RBI with runners on base and .667 (4-for-6) with 12 RBI with the bases loaded so far this season. the first average decreased a bit, but is still more than fine overall. lastly, Michael's hitting .293 (48-for-164) with the bases empty right now. he has 9 doubles, 1 triple, 8 home runs, 8 RBI, 12 walks, 2 hit by pitches, and 20 strikeouts (14 swinging, 6 looking). vs. the Kansas City Royals, Michael's batting .320 (8-for-25) in 6 home games. the Indians are 4-2 in the games he's played in. overall, Michael has 5 singles and 3 extra base hits, including 1 double and 2 home runs (1 being a grand slam), as well as 11 RBI, 6 runs, 1 walk, 4 first at bat hits, and 15 total bases. he's also reached base on 1 fielder's choice, grounded into 1 double play, has 2 strikeouts looking, and left 9 men on base. furthermore, he has a .346 OBP, .600 SLG, and .946 OPS. in left field, Michael's recorded 5 putouts while playing 45 innings/5 complete games. he was the DH for 1 game. vs. the Minnesota Twins, Michael's batting .243 (9-for-37) in 9 games--6 on the road and 3 at home. the Indians are 3-6 in the games he's played in. overall, Michael has 5 singles and 4 extra base hits, including 2 doubles and 2 home runs, as well as 4 RBI, 1 sac fly, 4 runs, 4 walks, 1 stolen base (2nd), 1 first at bat hit, and 17 total bases. he's also grounded into 2 double plays, has 2 strikeouts swinging, and left 14 men on base. furthermore, he has a .310 OBP, .459 SLG, and .769 OPS. in left field, Michael's recorded 18 putouts and acquired 1 assist while playing 73 innings, but only 6 complete games. he was subbed out defensively after 8 innings in 1 game in March/April because the Indians were winning and Michael had done more than enough in the game, and he was subbed out defensively after 8 innings in 1 game in June because the Indians were losing. he was the DH for 1 game. vs. the Chicago White Sox, Michael's batting .342 (13-for-38) in 9 of 10 games--6 at home and 3 of the 4 on the road. (he had 1 scheduled day off during one June road series.) the Indians are 7-2 in the games he played in and won the game he did not play in. overall, Michael has 10 singles and 3 extra base hits, including 1 double and 2 home runs, as well as 4 RBI, 9 runs, 2 walks, 1 hit by pitch, 1 stolen base (2nd), 1 caught stealing (3rd), 5 first at bat hits, and 20 total bases. he's also reached base on 1 fielder's choice, reached base on 1 fielding error, grounded into 3 double plays, has 4 strikeouts swinging, and left 25 men on base. furthermore, he has a .390 OBP, .526 SLG, and .917 OPS. in left field, Michael's recorded 17 putouts while playing 73 innings, but only 7 complete games. he was subbed out defensively after 5 innings in 1 game in May because the Indians were winning, and he was lifted for a pinch runner in the bottom of the 7th inning in 1 game in June because the Indians were winning. vs. the Detroit Tigers, Michael's batting .327 (16-for-49) in 12 of 13 games--6 of the 7 at home and 6 on the road. (he had 1 scheduled day off during one March/April home series.) the Indians are 9-3 in the games he's played in and won the game he did not play in. overall, Michael has 12 singles and 4 extra base hits, including 3 doubles and 1 home run, as well as 6 RBI, 5 runs, 4 walks, 1 hit by pitch, 2 stolen bases (2nd), 3 first at bat hits, and 22 total bases. he's also reached base on 1 fielder's choice, has 3 strikeouts swinging, and left 13 men on base. furthermore, he has a .389 OBP, .449 SLG, and .838 OPS. in left field, Michael's recorded 11 putouts while playing 74 innings, but only 6 complete games. he was lifted for a pinch runner in the bottom of the 6th inning in 1 game in March/April because the Indians were winning a blowout and Terry Francona wanted to give him some extra rest, he was lifted for a pinch runner in the top of the 9th inning in 1 game in May because the Indians were winning, and he was subbed out defensively after 7 innings in 1 game in June because he Indians were winning. he was the DH for 3 games. the Indians have played a total of 11 games against three National League teams through June. Michael has played in 10 of those games. the Indians are 7-3 in the games he's played in and lost the game he did not play in. overall, Michael's batting .297 (11-for-37) in Interleague Play so far in 2018.
vs. the Chicago Cubs at Progressive Field and Wrigley Field (no designated hitter allowed), Michael bat .385 (5-for-13) in 3 of the 4 games--1 of the 2 home games in March/April and 2 road games in May. (he had 1 scheduled day off during March/April home series.) the Indians went 3-0 in the games he played in and lost the game he did not play in. overall, Michael had 5 singles, 1 RBI, 2 runs, 1 walk, 1 caught stealing (2nd), 1 first at bat hit, and 5 total bases. he also had 1 strikeout swinging and left 6 men on base. furthermore, he had a .429 OBP, .385 SLG, and .813 OPS. in left field, Michael played 26 innings, but only 2 complete games. he was subbed out defensively after 8 innings in 1 game in May because the Indians were winning and Michael had done more than enough in the game. he recorded 6 putouts and acquired 1 assist and 1 double play as well. vs. the Milwaukee Brewers at Miller Park (no designated hitter allowed) and Progressive Field, Michael bat .286 (4-for-14) in 4 games--2 road games in May and 2 home games in June. the Indians went 3-1 in the games he played in. overall, Michael had 3 singles, 1 extra base hit--a double, 2 RBI, 2 runs, 2 walks, 1 first at bat hit, and 5 total bases. he also reached base on 1 throwing error, had 1 strikeout looking, and left 4 men on base. furthermore, he had a .375 OBP, .357 SLG, and .732 OPS. in left field, Michael played 35 innings/4 complete games and recorded 6 putouts. vs. the St. Louis Cardinals at Busch Stadium (no designated hitter allowed), Michael bat .200 (2-for-10) in 3 road games in June. the Indians went 1-2 in the games he played in. overall, Michael had 1 single, 1 extra base hit--a double, 2 runs, 3 walks, and 3 total bases. he also had 1 strikeout swinging and left 2 man on base. furthermore, he had a .385 OBP, .300 SLG, and .685 OPS. in left field, Michael played 24 innings, but only 2 complete games. he was subbed out defensively after 7 innings in 1 game because the Indians were losing a blowout. he recorded 4 putouts and committed 1 error as well. 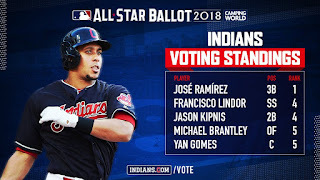 among qualifying left fielders in the American League, Michael's ranked 2nd in singles (57); 4th in hits (87), batting average (.306), OBP (.355), and OPS (.848); tied for 4th in doubles (18); 5th in total bases (140); tied for 5th in sac flies (3); tied for 6th in RBI (44); 7th in extra base hits (30), at bats (284), and SLG (.493); tied for 7th in stolen bases (5); 8th in home runs (11), runs (41), and plate appearances (310); tied for 9th in games played (70); and tied for 10th in triples (1). Michael's also ranked 15th out of 15 players in strikeouts (29), making him the hardest AL LF to strike out right now. among qualifying outfielders in the American League, Michael is 5th in singles, 7th in batting average; tied for 8th in hits and sac flies; tied for 9th in doubles; and 10th in OBP and OPS. besides that, out of 35 players, he's 35th in strikeouts, meaning he's the toughest outfielder to strike out in the American League. among qualifying players in the American League, Michael ranks tied for 86th in strikeouts out of 87 players, so he's currently tied for the 2nd hardest AL player to K.
among all qualifying left fielders in the Major Leagues, Michael is 3rd in batting average, 4th in singles, 5th in hits, tied for 5th in doubles, 6th in total bases, tied for 6th in sac flies, 7th in OBP, 9th in extra base hits and OPS, tied for 9th in RBI, and tied for 10th in at bats. he's also 27th of 27 players in strikeouts, or the toughest left fielder in MLB to strike out. among all qualifying outfielders in the Major Leagues, Michael ranks 8th in batting average. he additionally ranks tied for 66th out of 66 players in strikeouts, meaning he's tied for the hardest MLB OF to strike out. among all qualifying players in the Major Leagues, Michael's strikeouts are tied for 161st out of 162 players, making him tied for the 2nd hardest player to strike out in all of Major League Baseball. 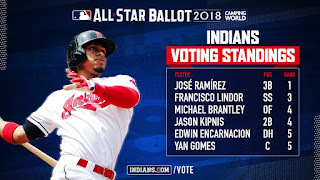 the first American League All Star voting results were released on Tuesday, June 12. in total, six Indians players made it into the top spots at their positions. Michael debuted in 4th place, just like last year, with 238,659 votes. 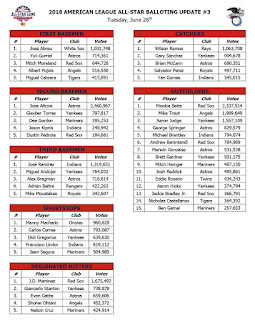 Mike Trout of the Los Angeles Angels and Aaron Judge of the New York Yankees were in the Top 3, 2nd and 3rd, respectively, and Mookie Betts of the Boston Red Sox led the pack with more than 100,000 votes than Trout. these were the three that i assumed would be in the top based on both popularity and 2018 statistics. 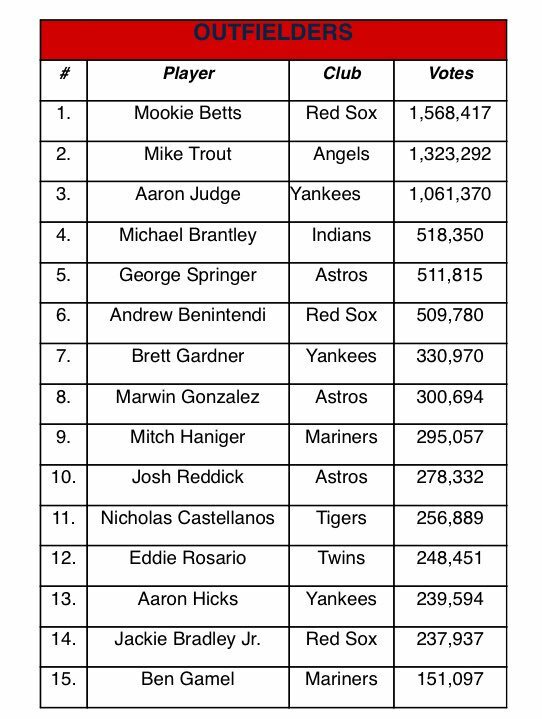 after crunching the numbers, i discovered Michael was 303,324 votes behind Judge, but just 13,343 ahead of 5th place George Springer of the Houston Astros. 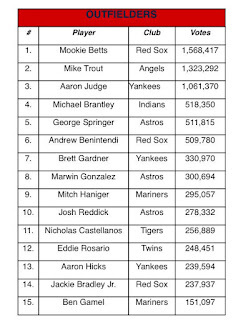 not to be outdone, Andrew Benintendi of Red Sox was in 6th place and only 29,822 votes behind Michael. so it was a pretty close race. btw, Indians outfielder Tyler Naquin, who was still on the disabled list at this time and had been since May 12 with a mild left hamstring strain and hadn't played enough this year prior to his injury to be a qualifier, rounded out the OFs in 15th place. that was a big surprise. 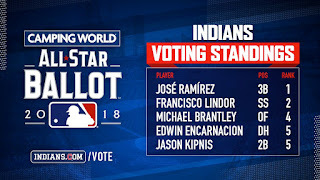 the next set of AL All Star voting updates came out on Tuesday, June 19. Michael remained 4th and had gained 279,691 votes in one week. 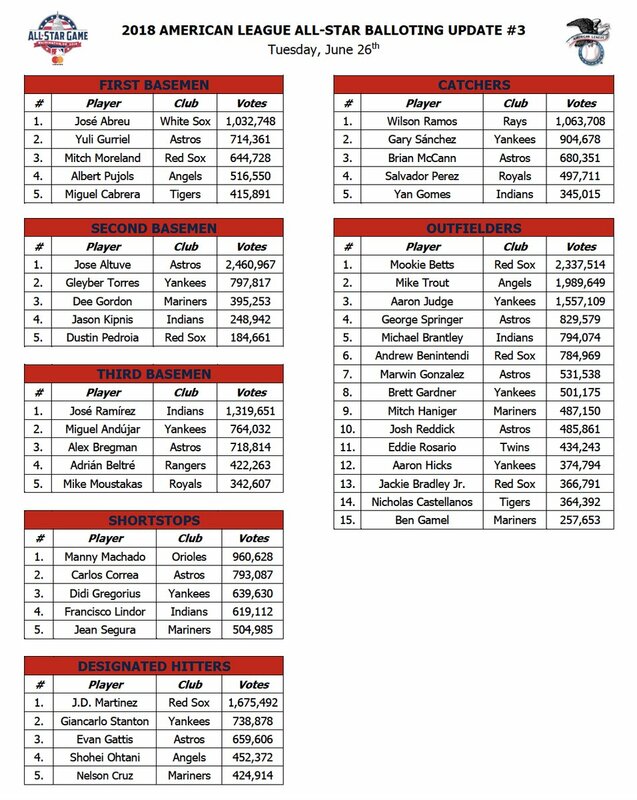 however, his lead over 5th place Springer had dwindled to just 6,535 votes, not to mention 6th place Benintendi was only behind Michael by a mere 8,570 votes. unfortunately, Michael still trailed Judge by a significant amount of votes--543,020 to be exact, and he was a monstrous 1,050,067 votes in back of 1st place Betts. Trout stayed in the #2 spot. on Tuesday, June 26, the last wave of AL OF results that were made public prior to the end of voting were disclosed. unfortunately, Michael had fallen down to 5th place, which i figured would happen. though he gained 275,724 votes over a week, he trailed 4th place Springer by 35,505 votes and 3rd place Judge by 763,035 votes. in addition, he had a 9,105-vote lead ahead of Benintendi, who was holding steady in the 6th spot. Betts and Trout still had commanding leads at 1st and 2nd. so that's it. no more updates until we find out who actually made this year's All Star squad on Sunday, July 8, during ESPN's All Star Selection show at 7 pm ET. voting is open for another five days, until 11:59 pm ET on Thursday, July 5. get your last votes in now, VOTE FOR MICHAEL HERE! in three months of play, Michael has recorded 100 putouts, acquired 3 assists, and committed 1 error in 104 total chances. he now has a .990 fielding percentage. he's also turned 1 double play through June. 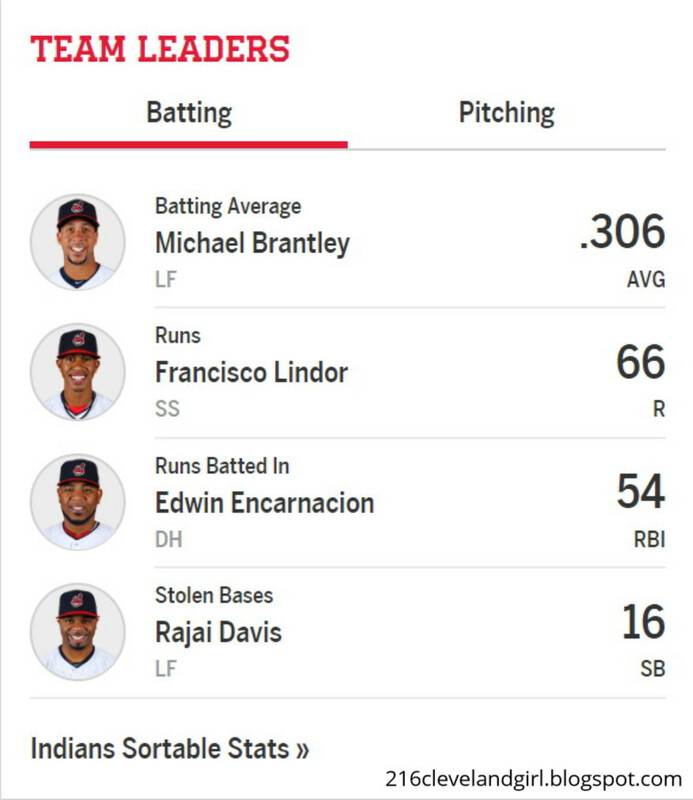 as i mentioned in the Brantley's June 2018 #s blog, Michael made a fielding error in the game on June 27, which was his first since June 10, 2017. so he currently only has a puny 3-game errorless streak in the outfield. at this point, it's obvious he won't come close to matching his career high/Indians club record of 247 consecutive games without an error from 2014 this year. among AL left fielders, Michael's 3 assists in 2018 ranks tied for 9th with 7 other players. Alex Gordon of the Kansas City Royals and Trey Mancini of the Baltimore Orioles have the most assists right now with 7. in addition, Michael's 1 double play ranks tied for 1st with 12 other players. among all MLB left fielders, Michael's 3 assists rank tied for 14th (with 10 other players). among all AL outfielders, Michael's 3 assists rank tied for 29th (with 7 other players). among all MLB outfielders, Michael's 3 assists rank tied for 45th (with 16 other players). the current MLB OF assist leaders are Mitch Haniger of the Seattle Mariners and Leonys Martin of the Detroit Tigers with 9.
now let's break down the numbers. i am going to document his 2018 # through June, the 2nd spot #s, the 4th spot #s, the 5th spot #s, the 6th spot #s, the PH #s, and the DH #s, as well as the left field #s, BOP + left field #s, and overall outfield #s.
Michael played in 70 (of 81) games, 57 complete, in 2018 through June. he started and played left field in 63 games, completing 51 of those games, appearing in 63 total. he was lifted for a PR in 4 games after playing a total of 28 innings; 1 game in the bottom of the 6th inning because the Indians were winning a blowout, 1 game in the bottom of the 7th inning because the Indians were winning a blowout, 1 game in the top of the 9th inning because the Indians were winning, and 1 game in the bottom of the 7th inning because the Indians were winning. he was subbed out defensively in 8 games after playing a total of 59 innings; 5 games after playing a total of 36 innings (8 innings/8 innings/8 innings/5 innings/7 innings per game) because the Indians were winning and he had done more than enough in the game, and 3 games after playing a total of 23 innings (8 innings/8 innings/7 innings per game) because the Indians were losing. he was the DH in 6 games. he got 5 scheduled games off. Michael bat 2nd in 44 games. Michael bat 4th in 21 games. Michael was the DH in 6 games. Michael played in 57 complete games.